The drill runs for 4 minutes after 2 minutes the players switch to other side of floor. The object is to make a certain number of lay ups in 4 minutes. 2 coaches at 1/2 court facing different directions and 2 players at opposite elbows of the foul line. Rest of team is split under each basket with first 2 players at each end with a basketball. The drill starts with ball being passed to coach at 1/2 court player follows pass. Coach returns pass to player who passes to player at elbow. Player at elbow returns pass. Player shoots. 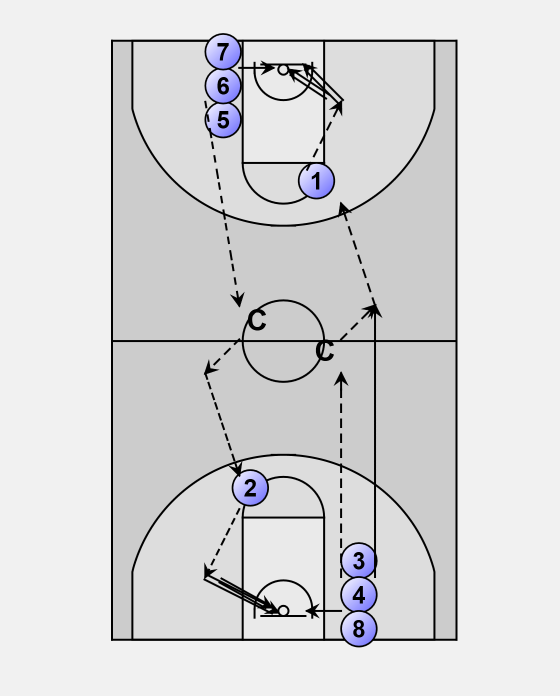 Next player in line gets ball out of basket and repeats same thing. Players start at same time on each end of floor. When first player in line gets return pass from coach the second player with the basketball will start.